We constantly emphasize how unhealthy smoking is, yet may people stick to the habit. Smoking is an addiction, and even if the effects of smoking are not visible now, you will both feel and see the effects as time goes on because smoking takes years off your life. One single cigarette decreases your life by 12 minutes. 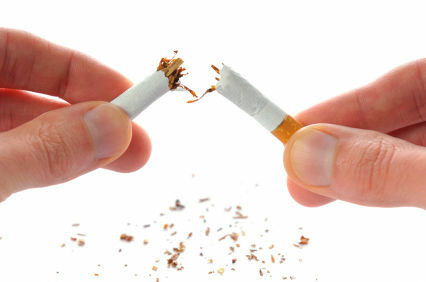 To quit smoking is not easy and requires great motivation and a strict regimen, but it is not an impossible thing to do. Decide to quit. The decision to quit must come from you and should be your own personal choice, not anybody else’s. When you make your decision, stick to it! A great way to make sure you stick to it is by informing your family and friends of your decision so they can give you the support you need. Remember that it is more effective to go on the road to recovery when you have family and friends guiding and supporting you along the way. Choose a day to officially stop smoking. This will help you mark your progress as each day passes and make it easier to keep track of your improvement. Clean all traces of smoking from your home. Wash your rugs, towels, clothes and other things exposed to cigarette smoke. If possible, clean the walls and furniture, too. Erase all traces of nicotine in your home. Use a nicotine patch. Apply this patch to your skin so it can provide nicotine to your body so as not to overwhelm your body by quitting smoking abruptly. The point here is to slowly attune your body to the absence of cigarettes since some people find it hard to quit instantly. Chew nicotine gum. Working much like a nicotine patch, the gum will also cause your body to grow accustomed to less and less nicotine so you can slowly walk away from smoking. When you get the urge to smoke, chew the gum instead. Change your schedule. Plan other activities for the times when you usually smoke. It’s best to keep your mind and body busy to steer you away from the urge to smoke. Put “no smoking” signs in your areas. Surround your work place or even your home and car with non-smoking signs. This is to remind you regularly of the decision you made. These signs will keep you on the right path toward recovery.